For many adult children, it can be difficult to admit that our parents are getting older, and it can be even harder for aging parents to accept that they need help. However, ignoring the warning signs only puts our loved ones at risk. Whether you’ve noticed a decline in your parent’s ability to perform everyday tasks, or a fall or dementia diagnosis has prompted a healthcare provider to recommend additional care, it may be time to consider an Assisted Living/Enriched Housing community. You and your parents will undoubtedly have questions and maybe even strong feelings about the process. So to help answer your questions and ease any concerns, here are 4 important things that all adult children and their parents should know about Assisted Living/Enriched Housing. How Do I Know When My Parent Needs Assisted Living/Enriched Housing? There are typically three instances when the need for Assisted Living/Enriched Housing becomes apparent. The most obvious is when your parent is injured in a fall or develops an illness, requiring hospitalization. Upon discharge from the hospital, a social worker or medical professional may even recommend Assisted Living/Enriched Housing. The often more difficult to address instance is when you notice a decline in your parent’s ability to maintain their home or personal hygiene. Perhaps they are reluctant to perform tasks that were once done easily, such as grocery shopping or paying bills, and when asked, they make excuses. A diagnosis of dementia or Alzheimer’s disease is another case when a memory care community may be necessary to keep your parent healthy and safe. To help you understand when more help is needed, read When is the Right Time for Memory Care. What is the Difference Between Assisted Living/Enriched Housing & Skilled Nursing Care? An Assisted Living/Enriched Housing community is not the same as an independent senior living community, but it is also important to understand that it is different than a nursing home. Assisted Living/Enriched Housing is for people who need help on a daily basis, but who are generally much healthier than skilled nursing patients. This is an important distinction, as many aging parents will resist Assisted Living/Enriched Housing, assuming that it’s for people who are much older or sicker. With Assisted Living/Enriched Housing, residents generally receive help with everyday tasks such as dressing, bathing, medication management and household chores, as well as freshly prepared meals. Exceptional Assisted Living/Enriched Housing communities also offer recreational and social activities, wellness and educational programs and transportation. Similar to independent living communities, seniors typically reside in their own apartment. While emergency alert systems are often installed in each unit, it is important to note that residents are not under the care of medical professionals 24/7. If your parent requires around-the-clock care, you may want to consider a skilled nursing facility or 24-hour memory care. How Do I Talk with My Parents About Assisted Living/Enriched Housing? Conversations about age-related changes and Assisted Living/Enriched Housing are never easy, but with preparation and patience, it’s possible to have a healthy discussion with your parents. It helps to be empathetic and put yourself in your their shoes – this will help you speak with compassion and patience. Remember to focus on the positive, such as the amenities and activities, or social connections and delicious chef-prepared meals, and try referring to Assisted Living/Enriched Housing as a “community” rather than a facility, and “condo-style living” instead of rooms. For more conversation starters and tips, read Having “The Talk” When it’s Time for Your Parents to Embrace Assisted Living. How Do We Choose an Assisted Living/Enriched Housing Community? To start your search, ask friends, family and healthcare providers for recommendations, and search online for information and reviews. Ultimately, you and your loved one should plan to tour the Assisted Living/Enriched Housing communities that you are considering. You’ll want to evaluate the apartments or rooms, and “interview” the staff. Find out how medical emergencies are handled, and ask about security. Learning about the food and dining options, transportation availability and recreation and social activities are equally important – it’s not just about the quality of care the Assisted Living/Enriched Housing community provides, but also the quality of life. To prepare for your visit, read What to Look for in an Assisted Living/Enriched Housing Community. If you are currently looking at Assisted Living/Enriched Housing for your aging parents, we invite you to visit one of the beautiful Terrace Communities of Eddy Senior Living. 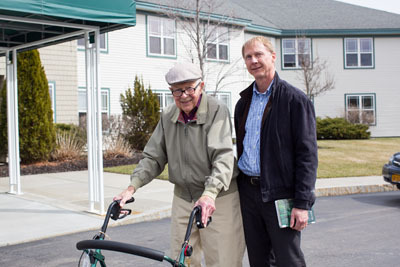 Our Enriched Housing and Assisted Living communities in Slingerlands, Troy, Niskayuna, East Greenbush and Queensbury NY offer all the comforts and amenities of an independent senior living community with caring, daily assistance tailored to each individual’s needs. Contact us or call (877) 748-3339 to speak directly with a senior living specialist and schedule a tour.